Now, obviously this recipe is not from Kitchen, but one I cobbled together myself, after some insistent requests at my house for an apple dessert. Who was I to refuse? I used the pastry recipe from Nigella's cherry pie (How to Eat), which I've also used recently for a cherry and apple pie. Made it all by hand, thank-you very much, because I don't have a processor at my new place. (Yet!) It was actually a lot easier to work with than my previous attempts and didn't fall apart or break on me - perhaps because I did it by hand rather than processor I didn't overwork it? Either way, I was able to roll it out thinly with no problems. I got the filling from Donna Hay's Modern Classics 2, which I chose mainly for its pretty appearance and simple recipe. 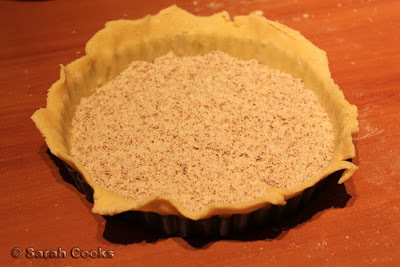 I lined a shallow 20cm pie tin with the pastry, and sprinkled it with almond meal to prevent it from going soggy. I peeled, cored and chopped a few granny smiths, and cooked them in a pan with butter and water until slightly softened. Then I added a bit of sugar and cinnamon, and arranged them in the pie tin. I probably could have gone a bit higher with the apples - in Donna's book she fills it up super-high, almost triple the height of the pie, but I think this is more for cosmetic reasons than for taste. Then it was a matter of putting on the pastry lid, sealing the edges and trimming it nicely! I love the billowing top of the pie. My edges were a bit wonky, but I think it adds to the rustic charm. 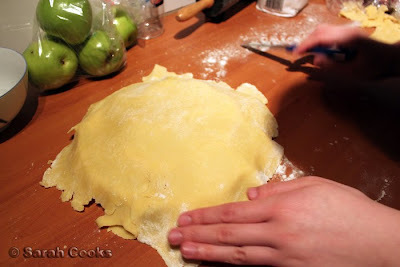 I actually found it quite hard to seal the pastry because I rolled it out so thinly and it was in a shallow tin. 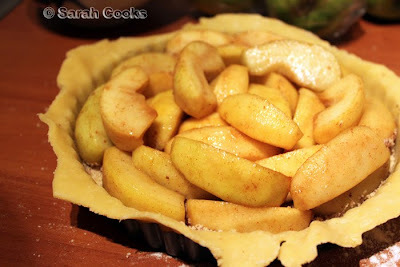 You'll see the first time I made a pie with this pastry, I used the same tin but had the pastry much thicker. It not only looked prettier, but I thought it tasted better the first time. Y'all know I'm a biscuit / pastry fiend! The more crunchy pastry goodness, the better! The second time I made a pie this pastry, it was a larger tin, but still thinly rolled, which I think worked well apart from the dodgy looking edges! I served the pie with vanilla ice-cream sprinkled with cinnamon-sugar. (Got the idea from seeing the Löwenbräu "Christmas in July" dinner on ChocolateSuze's and Helen's blogs.) I double checked with Ze German, she confirmed that they do it back home in Germany - approved! 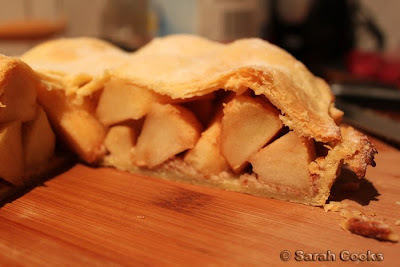 I think it looks quite good with the big chunks of apple and billowing top (like a pastry version of Southern Cross railway station, hehe), but after eating the pie, I must say I prefer a grated or pureed filling. And as mentioned above, I'd prefer a thicker pastry. Doughy goodness - yes please! I had half of the pastry leftover, so I could easily have gone for thicker pastry. But despite all my nitpicking, it was actually a rather fabulous pie, and was ecstactically received. 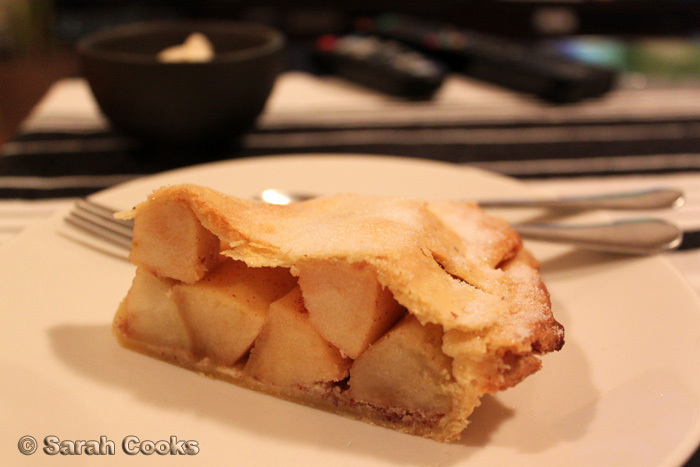 I'm sure no-one will complain, however, if I start working on perfecting my apple pie. Any volunteer tasters? Ahhh I can smell it now. 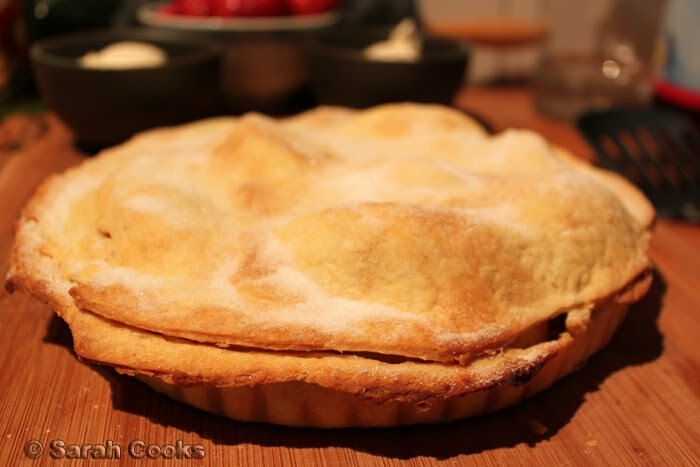 I've been meaning to make apple pie for ages! I must go check out that Nigella book. That can be my job during my break tomorrow.. could get expensive.. been buying too many books lately!! That pie looks gorgeous, even if you think the pastry could have been thicker and the apples less thick. I've never made apple pie, in fact I don't make a lot of pie at all but this is making me want to :) I definitely remember your SDHTE project, one of the things that inspired me to blog in the first place! 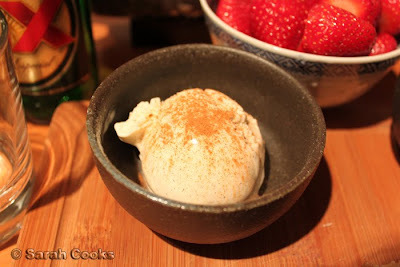 Ice cream with cinnamon sugar is a genius idea, I'm going to replicate it at some stage. Gee you really are Nigella mad! :) I'll put my hand up to be a taste tester for your baked goods, but unfortunately I don't like apple pie *waiting for the backlash*! wonder if smaller chunks and some sort of apple syrup'y mixture would help... though speaking of which that sounds like the maccas one oops. I quite like the nice big chunks. Maybe half puree and half chunks? great job of the pie sarah! I loved the chunky apples in the pie too. That pie was definitely excellent last time. I'd love to eat another piece of it.